The Venice Film Festival or Venice International Film Festival (Italian: Mostra Internazionale d'Arte Cinematografica della Biennale di Venezia, "International Exhibition of Cinematographic Art of the Venice Biennale") is the oldest film festival in the world and one of the "Big Three" film festivals, alongside the Cannes Film Festival and Berlin International Film Festival. The Big Three are internationally acclaimed for giving creators the artistic freedom to express themselves through film. Founded in Venice, Italy, in August 1932, the festival is part of the Venice Biennale, an exhibition of Italian art founded by the Venice City Council on 19 April 1893. The range of work at the Venice Biennale now covers Italian and international art, architecture, dance, music, theatre, and cinema. These works are experienced at separate exhibitions: the International Art Exhibition, the International Festival of Contemporary Music, the International Theatre Festival, the International Architecture Exhibition, the International Festival of Contemporary Dance, the International Kids' Carnival, and the annual Venice Film Festival, which is arguably the best-known of all the events. The festival is held in late August or early September on the island of the Lido in the Venice Lagoon. Screenings take place in the historic Palazzo del Cinema on the Lungomare Marconi. The festival continues to be one of the world's most popular and fastest-growing. The 76th Venice International Film Festival is scheduled for 28 August to 7 September 2019. During the 1930s, the government and Italian citizens were heavily interested in film. Of the money Italians spent on cultural or sporting events, most of it went for movies. The majority of films screened in Italy were American, which led to government involvement in the film industry and the yearning to celebrate Italian culture in general. With this in mind, the Venice International Film Festival was created by Giuseppe Volpi, Luciano de Feo, and Antonio Maraini in 1932. Volpi, a statesman, wealthy businessman, and avid fascist who had been Benito Mussolini's minister of finance, was appointed president of the Venice Biennale the same year. Maraini served as the festival's secretary general, and de Feo headed its executive committee. On the night of 6 August 1932, the festival opened with a screening of the American film Dr. Jekyll and Mr. Hyde on the terrace of the Excelsior Palace Hotel. A total of nine countries participated in the festival, which ended on 21 August. No awards were given at the first festival, but an audience referendum was held to determine which films and performances were most praiseworthy. The French film À Nous la Liberté was voted the Film Più Divertente (the Funnest Film). The Sin of Madelon Claudet was chosen the Film Più Commovente (the Most Moving Film) and its star, Helen Hayes, the best actress. Most Original Film (Film dalla fantasia più originale) was given to Dr. Jekyll and Mr. Hyde, and its leading man, Fredric March, was voted best actor. Despite the success of the first festival, it did not return in 1933. In 1934, the festival was declared to be an annual event, and participation grew from nine countries to seventeen. That year the festival also gave its first official awards, namely the Mussolini Cup for Best Italian Film, the Mussolini Cup for Best Foreign Film, and the Corporations Ministry Cup. Seventeen awards were given: fourteen to films and three to individuals. Five films received honorable mentions. The third installment of the festival in 1935 was headed by its first artistic director, Ottavio Croze, who maintained this position until World War II. The following year, a jury was added to the festival's governing body; it had no foreign members. The majority of funds for the festival came from the Ministry of Popular Culture, with other portions from the Biennale and the city of Venice. The year 1936 marked another important development in the festival. A law crafted by the Ministry of Popular Culture made the festival an autonomous entity, separate from the main Venice Biennale. This allowed additional fascist organizations, such as the Department of Cinema and the Fascist National Federation of Entertainment Industries, to take control of the festival. The fifth year of the festival saw the establishment of its permanent home. Designed and completed in 1937, the Palazzo del Cinema was built on the Lido. The Palazzo has since been the site for every Venice Film Festival, with the exception of the three years from 1940 to 1942, when the festival was moved away from Venice for fear of bombing. However, Venice received almost no damage during that time. The Doge's Palace in Piazza San Marco hosted the 1947 edition. The 1940s represent one of the most difficult moments for the festival itself. Nazi propaganda movie Heimkehr was presented in 1941 winning an award from the Italian Ministry of Popular Culture. With the advent of the conflict the situation degenerated to such a point that the editions of 1940, 1941 and 1942, subsequently are considered as if they did not happen because they were carried out in places far away from Lido. Additionally, the festival was renamed the Italian-German Film Festival (Manifestazione Cinematografica Italo-Germanica) in 1940. The festival carried this title until 1942 when the festival was suspended due to war. The festival resumed full speed in 1946, after the war. For the first time, the 1946 edition was held in the month of September, in accordance to an agreement with the newly-born Cannes Film Festival, which had just held its first review in the spring of that year. With the return of normalcy, Venice once again became a great icon of the film world. In 1947 the festival was held in the courtyard of the Doge's Palace, a most magnificent backdrop for hosting a record 90 thousand participants. The 1947 festival is widely considered one of the most successful editions in the history of the festival. In 1963 the winds of change blow strongly during Luigi Chiarini’s directorship of the festival (1963–1968). During the years of his directorship, Chiarini aspired to renew the spirit and the structures of the festival, pushing for a total reorganization of the entire system. For six years the festival followed a consistent path, according to the rigid criteria put in place for the selection of works in competition, and took a firm stand against the political pressures and interference of more and more demanding movie studios, preferring the artistic quality of films to the growing commercialization of the film industry. The social and political unrest of 1968 had strong repercussions on the Venice Bienniale. From 1969 to 1979 no prizes were awarded and the festival returned to the non-competitiveness of the first edition. In 1973, 1977 and 1978, the festival was not even held. The Golden Lion didn't make its return until 1980. The long-awaited rebirth came in 1979, thanks to the new director Carlo Lizzani (1979–1983), who decided to restore the image and value the festival had lost over the last decade. The 1979 edition laid the foundation for the restoration of international prestige. In an attempt to create a more modern image of the festival, the neo-director created a committee of experts to assist in selecting the works and to increase the diversity of submissions to the festival. To celebrate the 70th edition of the festival, in 2013 the new section "Venezia 70 – Future Reloaded" was created. During the recent years, under the direction of Alberto Barbera, the festival established itself as an Oscars launchpad, increasing the presence of American movies and hosting the world premieres of Academy Award-winning films such as Gravity (2013), Birdman (2014), Spotlight (2015), La La Land (2016) and The Shape of Water (2017). In 2017 a new section for virtual-reality (VR) films was introduced. In 2018 Roma by Alfonso Cuarón won the Golden Lion and became the first ever movie produced by Netflix to be awarded in a major film festival. The president of the Venice Biennale represents the festival in front of its financial partner, the public authorities, and the media. He is chosen by the Italian Ministry of Cultural Heritage. The current president, appointed in 2008, is Paolo Baratta; he was also president from 1998 to 2002. The director is responsible for coordinating the events and is chosen by the president of the Venice Biennale and its delegates. The current director, Alberto Barbera, was appointed in 2012, and his term will end in 2020. Barbera previously held the position from 1999 to 2002. Golden Osella, awarded to the Best Technical Contribution (to cinematographers, composers, etc.) and for the Best Screenplay. Special Lion, awarded for an overall work to a director or actor of a film presented in the main competition section. This section is open to all "custom-format" works, with a wider view towards new trends in the expressive languages that converge in film. Cinema Palace during the 74th Venice International Film Festival. Jaeger-LeCoultre Glory to the Filmmaker Award, organized in collaboration with Jaeger-LeCoultre since 2006. It is dedicated to personalities who have made a significant contribution to contemporary cinema. The Mussolini Cup was the top award from 1934 to 1942 for Best Italian and Best Foreign Film. Named after Italy's dictator Benito Mussolini, it was abandoned upon his ouster in 1943. "Le Grandi Medaglie d’Oro dell’Associazione Nazionale Fascista dello Spettacolo" in Italian. This was awarded to Best Actor and Best Actress. It was later replaced by the Volpi Cup for actors and actresses. The first time this prize was awarded to Katharine Hepburn for her role in Little Women by George Cukor. In the first edition of the festival in 1932, due to the lack of a jury and the awarding of official prizes, a list of acknowledgements was decided by popular vote, a tally determined by the number of people flocking to the films, and announced by the Organizing Committee. From this, the Best Director was declared – Russian Nikolai Ekk for the film Road to Life, while the film by René Clair À Nous la Liberté was voted Best Film. ^ Anderson, Ariston. "Venice: David Gordon Green's 'Manglehorn,' Abel Ferrara's 'Pasolini' in Competition Lineup". The Hollywood Reporter. Retrieved 9 September 2018. 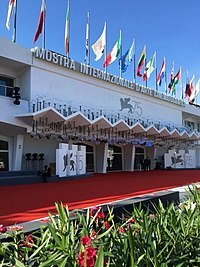 ^ "Addio, Lido: Last Postcards from the Venice Film Festival". TIME. Retrieved 9 September 2018. ^ Chan, F. (1 June 2011). "The international film festival and the making of a national cinema". Screen. 52 (2): 253–260. doi:10.1093/screen/hjr012. ^ "La Biennale di Venezia – The origin". 2017-04-07. Retrieved 9 September 2018. ^ Bergamin Barbato, Maria; Mio, Chiara (1 March 2007). "Accounting and the Development of Management Control in the Cultural Sphere: The Case of the Venice Biennale". Accounting, Business & Financial History. 17 (1): 187–208. doi:10.1080/09585200601127871. ^ Evans, Owen (1 April 2007). "Border Exchanges: The Role of the European Film Festival". Journal of Contemporary European Studies. 15 (1): 23–33. doi:10.1080/14782800701273318. ^ Ben-Ghiat, Ruth (2015). Italian Fascism's Empire Cinema. Indiana University Press. pp. 4–5. ^ a b Taillibert, Christel; Wäfler, John (2016-01-02). "Groundwork for a (pre)history of film festivals". New Review of Film and Television Studies. 14 (1): 5–21. doi:10.1080/17400309.2015.1106688. ISSN 1740-0309. ^ a b Hibbert, Christopher (1989). Venice: The Biography of a City. W.W. Norton & Company, Inc. pp. 315–320. ISBN 978-0-393-02676-4. ^ a b c d e f "ASAC Dati". asac.labiennale.org (in Italian). Retrieved 2018-11-29. ^ a b c d "History of the Venice Film Festival". 2017-12-07. Retrieved 9 September 2018. ^ Shoard, Catherine (2018-07-25). "Best program ever: Mike Leigh, Coens and Cuaron set for Venice film festival". The Guardian. Retrieved 9 September 2018. ^ "Venice Film Festival winner list". Variety. 2018-09-08. Retrieved 9 September 2018. ^ "Carnival of Venice, Marcello Mastroianni Award". Carnival of Venice. Retrieved September 29, 2014. ^ "Four new "Orizzonti" awards". labiennale.org. Archived from the original on 26 March 2010. Retrieved 26 April 2018. ^ "Carnival of Venice, Portale di Venezia® – The 1930s". Carnival of Venice. Retrieved September 29, 2014. ^ a b c "La Biennale di Venezia – The 30s". Retrieved September 29, 2014. 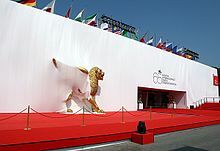 ^ "Golden Lions and major awards of the Venice Film Festival". labiennale.org. Archived from the original on 14 April 2004. Retrieved 22 July 2018. Wikimedia Commons has media related to Venice Film Festival.